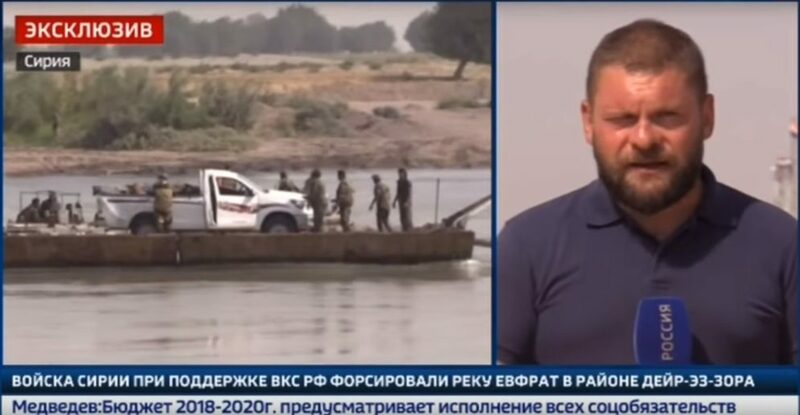 The Russian media Tuesday, Sept. 19 published photos of the pontoon bridges supplied by Russia to convey Syrian troops across the river to the eastern bank. It is hailed as one of the most important military feats of the Syrian war. DEBKAfile’s military sources add that Hizballah forces are part of the contingent crossing the river. The Syrian army issued this statement Tuesday: Elite troops of the Syrian Arab Army have crossed from the western bank to the eastern bank of the Euphrates River in Deir ez-Zour Governorate. The elite “ISIS Hunters Unit” claims to be the first Syrian Army formation to reach the eastern bank. DEBKAfile: While the rhetoric flows from Prime Minister Binyamin Netanyahu’s talks with world leaders in New York, a profound strategic event is taking place on the Syrian-Iraqi border: Iran is winning a land corridor through Iraq and Syria to the Mediterranean Sea with Russian support but without the US or Israel taking any counteraction. The river crossing with the help of Russian pontoon bridges was revealed by DEBKAfile Saturday, Sept. 16. Iran’s new army chief, Maj. Gen. Abdolrahim Mousavi, threatened Monday to raze Haifa and Tel Aviv to the ground if Israel makes any mistake. “The notion that the Zionist regime of Israel will not exist 25 years from now does not mean that it would have a full life span of 25 years,” he said. The general, who was appointed commander-in-chief of the Islamic Republic of Iran Army last month, added: “Israel should sit quietly and count down the days to its death, because any minor mistake would lead to its demise with the speed of lightning,” he was quoted as saying by Iran’s Tasnimnews agency. Iran threatening Israel is nothing new. The redesign of DEBKA.com is ***great***. I’m telling all my email friends about. Even my (only) one friend in the West Wing of the White House. Shana Tova u’Mitukah to each of you! Tremendous improvement on look and feel of website. And I like the way the video is set up. Much respect to you.